Overstaying your visa is illegal. If you overstay for a short period you will have to pay a fine. However, if you overstay for more than 90 days then it is a serious offence and the result will be you are deported from Thailand and banned from visiting again. The length of the ban depends on how long you have overstayed your visa. From 20th March 2016, if you are caught overstaying by even one day, you will face a ban from re-entering Thailand of five years. If you have overstayed by more than one year, you will face a ban of ten years. If you have a very long overstay and turn yourself in to the authorities you will have to go before a judge in court. The overstay fine is usually waived and in it’s place a smaller fine imposed. You will then be held in the IDC ( Immigration Detention Center ) until you can arrange for a ticket on a direct flight back to your own country. You will then have to pay a small fee to the immigration officers to take you to the airport and accompany you through Immigration, where you will get the blacklist stamp in your passport, and to the gate. Your passport will be given to a steward on the flight and they will return it to you when you land in your home country. The good news is that if your overstay is under 90 days and you pay the fine then leave the country then you won’t have any problem returning to Thailand at a future date. There won’t be any black mark next to your name. Overstaying is when someone resides in Thailand for a period exceeding the length of time they are permitted to do so by their visa or entry stamp. It is your responsibility to ensure that you do not overstay. However, the Thai Immigration officials realise that sometimes people make mistakes and book a flight a day too late or their plans change, a flight is cancelled and they have to leave a day late. In cases such as these, with a few hours overstay, the 500 Baht overstay fine is usually waived. If you are in a situation like this, don’t panic. Just explain to the immigration officer when you are being stamped out of the county. Apologise and you will be treated fairly. If you have a longer overstay, for example, 1 week, then you will be required to pay this ( 7 days x 500 Baht = 3,500 Baht ) before you can leave the country. It is easiest to pay when you fly out. Again, explain the reason to the immigration office at the airport, then you will be taken to a nearby counter when you can pay the overstay fine. Please ensure that you have enough funds to cover this. If not, then you may be taken to the holding cells until you can raise funds. Children under the age of 15 are not charged a fine for overstaying but still get overstay stamps when they leave the country. Being exempt from the fine does not make them exempt from needing a valid visa entry or extension to stay in the country. Please note that repeated violations of overstaying can hold serious consequences. In the event that you have had a few overstays, your passport could be stamped with a stamp declaring you in violation of the immigration laws and regulations of Thailand. This stamp will label you as an “undesirable alien”, which could make travel and obtaining entry to other countries much harder than it should be. Where is the Immigration Detention Centre? The IDC is located in central Bangkok at the Immigration Office on Soi Suanplu, Bangkok. This is where anyone who has been arrested for overstaying will be held prior to attending court and then whilst waiting for their flight back home to be arranged. You can call on: 02 213 2369 but it is better to go in person. Go to Building 5 at the IDC. You will need the overstayer’s details: Name, nationality, age, arrest date and location. No. Because there is no record of you having left Thailand. So it appears that you are 4 years overstay. Hello! I’ve been overstay in Thailand for two and a half years. It wasn’t because I didn’t have money to go back home, it was because I had to stay here to take care of my GF(She’s Thai.) Long story short, I fell in love. I know that won’t matter much to the courts but, it is what it is. I just want to know what to do from here. I have all the money for a ticket and any fees. Get a ticket back to your own country. Go to the airport and pay the 20,000 Baht fine before you leave. hi, im overstay for few years and.. i have thai wife and baby 4 years.. is it ok to i just buy ticket for 3 of us and go airport and pay fine and leave Country… i knows i get ban for 10 years maybe, but thats my stupid fault and family problem. but im stuck here between 2 families… i accept the bans and just want leave without problem for my baby and wife… i buy tickets for next week and just dono whats next? i just go directly to airport and tell immigration and pay fine? is that they arrest me??? how much fine cost? Hi Admin, a friend of mine moved to Thailand a few years ago, got married, and had a Thai marriage visa. Her visa expired years (5+ years), do the same laws apply? Is there anyway to take care of this in Thailand and avoid being blacklisted and deported? Her husband was not in Thailand at the time and is back now. The same rules apply to everyone. She doesn’t have a valid visa so has been overstaying 5+ years. It is better if she leaves voluntarily by getting a ticket back to her own country and going to the airport. I have a question about my Tursit visa. I have just noticed that my visa expires tomorrow, 13.04.19 so that I will not be able to extend it in time. Is there any possibility on Monday ore a day after songkran to submit my visa extension, because my return flight is on 09.05.19. No problem to extend it on the first day the Immigration office is open after Songkran. But it will be very busy. If someone who overstayed for more than 5 years wants to leave and never come back to Thailand, will it be save to book a flight, and pay the 20,000 baht fine at the airport? What if it takes too long at immigration and she misses her flight? They should plan to go to the airport and check in early for their flight. It doesn’t take long to do the paperwork. No. The maximum it can be extended for is 30 days. Where at the border crossing do I do the visa exempt ? Do I still go to ther VOA counter? If you dont require a visa then you don’t need to get a Visa on Arrival office. Just go to the queue for Immigration. You can try but expect to have to prove beyond reasonable doubt that you are only coming on holiday. If the immigration officer suspects you plan to stay long and dont have a hotel booking, funds to support yourself and return ticket then you can be denied entry. I am working here. But my visa and work permit expired on March 31st, 2019. So, now I am staying overstay. My school contract also finished. So March 30th, 2019 only I found a new school. So, now I got a new school contract and everything. I don’t know, what should I do next process? Can I extention the visa and work permit? Please tell me mam. Because already am overstay here. If you have already overstayed then you have to leave the country and apply for a new Non Immigrant visa. Your new school will provide the paperwork. Hello, am working here. My visa and work permit expired on March 31st. But now am stay here. Because I found new school. Now, I got a new school documents and education certificate. So I need to extension the visa and work permit. I don’t know how to do? Contact you local Immigration office and they will explain how to do it. One question, I have been banned to entry for 1 year to 11 September 2019.. After that date, there is no problem coming back to Thailand? Entry into Thailand is at the discretion of the Immigration officer on duty. You will need to prove that you are here for tourism purposes and aren’t a risk of overstaying again. Yes I will show have booked a return ticket, booked hotel and money. Thanks! My girlfriend just got back to Bangkok from an extended stay on one of the islands that held her passport the entire time. She thought she had more time but the hostel in Bangkok pointed out her Visa is expired, by 11 days now. She has her flight booked for Thursday. What is her best/safest plan of action? She can pay the overstay fine at Immigration when she leaves the country. When she is at the Immigration counter, she can tell the officer she has overstayed and then they will take her to the overstay desk, behind the immigration counters. She can pay there. It won’t take long to do. Nothing to more worry in this case , just confirm your ticket and if her over stay tell her to count how many days overstay , then each days 500 baht calucate and go to directly the airport as a usual , take the boarding and go to immigration counter ,immigration officer will call another immigration officer to bring her another counter where she can fine then go to flight that’s it . * but make sure that while going to airport don’t stuck with any immigration officer ( outside airport) *. If safe reach airport then nothing to worry about it . I have overstayed for 45days I have take with an agency a flight to Malaysia for 3 days and come back to bangkok, I will pay the 20000B before going but I play professional football here and I want to do work permit visa 1 year when I come back is it a sufficient proof? Your employer will have to provide the documents for you to get a Non Immigration visa in Malaysia. Then when you come back to Thailand they will do the paperwork to get a Work permit for you. When we arrived at the Airport from denmark we got a 30 days turistvisum stamp. The stamps says 4. March to 2. April, but we Are first leaving thailand by bus to cambodia the 3. April. Will there be Any problem or should we go to the immigration office? 30 days is until 2 April. Day 1 is 4 March. So the stamp is correct. But it is common that people start counting the day after they arrive. So you won’t have any problems when you leave. Explain your mistake to the immigration officer at the border. Often the first 24 hours of overstay are forgiven & you won’t have to pay a 500 Baht fine. But that’s at the discretion of the official on duty. Hey we have a overstay by 6 hours. On the overstay day we are Going to cambodia with a bus. Are there any problems? Often short overstays of a few hours or under 1 day are forgiven by Immigration officers, as it is common. So the worst case is a 500 Baht fine. But that isn’t serious. You won’t have any problems leaving the country and it won’t affect any future visits to Thailand. I have a “under consideration” stamp that is 4 weeks old with no new stamps. Is this overstay as well? I did return on the date I was told to but the immigration office just says still under review with no stamps and will not let me 90 day report..
Thee stamp alone allows you to stay until your extension is approved. It does not expire on the report back date. Often short overstays of a few hours or under 1 day are forgiven by Immigration officers at the airport, as it is common. So the worst case is a 500 Baht fine. But that isn’t serious. You won’t have any problems leaving the country and it won’t affect any future visits to Thailand. Booked a return flight to the UK for May 6. Done a VISA run in Lao which was approved until 4th June, however I’ve just checked and the immigration officer in Mukdahan has stamped May 3. An oversight on my part because I just took it for granted what the Embassy applied in my passport. Worst case 1500THB fine? Assuming you dont have a history of overstaying then a 1,500 Baht fine is the worst case. A lot of people overstay a couple of days. Currently I am studying in Thailand but I completely forgotten that my visa have to be extended until 18 March. What should I do… I have overstayed 8 days already please I need help..
You will have to leave the country and get a new visa. You can’t extend a visa that has expired already. I blacklist for 5years and I want come back to Thailand. If any way that I pay charges and enter me to Thailand. My girlfriend is pregnant .I wanna marry her and then come back. Can immigation give me a permation to enter. You have to marry in your own country that is the easy way then you can come to Thailand. But I have seen few Indian people who have ban 3 and 5 years they change theyr passport also some spelling change and then come to Thailand. But however when you arrive Thailand if they don’t ask you more question then you maybe qualify to enter Thailand. The name in your passport might change. But your date of birth, age and height will probably be the same. And your face and your fingerprints will also be the same. Plus you could be charged with illegal entry. It probably isn’t a good idea to try. In the event it is not approved can I appeal the decision without leaving? Or do I need to leave the country, apply for a new typo 0 non immigrant and then reapply from scratch for the annual extension 60 days later as all need to show 400k for 60 days before applying? I have 2 small children who are dual citizens and a Thai wife and I’m starting to get nervous about being separated over beauracracy. Your local immigration office will be aware of the expiry date. So, assuming you have the provided all the correct documentation there shouldn’t be any problem. I will have 3 days overstay due to a booking error airline. The 3 x 500 thb overstay to be paid when leaving: does it has to be cash thb or is Mastercard credit card or SCB debit card accepted? Thank you. My brother and I have a one year ban because of overstay. We are from Singapore. We left bangkok on 10 May last year. When can we return to bangkok again? Is it 9 or 10 or 11 May? We have new passports because of expiry and the new passports do not have the blacklist stamp. But we are concerned that the system has our names, so we plan to enter the legal and proper way. If you want to be safe, you can try to enter on 11 May. You will have a new passport number but the Immigration officer will see your overstay details as your name , date of birth, face etc wont have changed. So you have to be prepared top prove that you are only here for tourism purposes and have a return flight, hotel booking, cash to support yourself etc. My 1 year overstay ban ends on april 14th. My flight back to bangkok is on april 13th. Will i be allowed to enter? No. Because you were banned for 1 year. The ban ends on 14 April not 13 April. Hello I’m not sure how to actually ask a question so I’m just doing it on this reply, my visa runs out on April 1st but I fly out on May 1st, as the immigration office isn’t open I’m going in on the 28th I’m going to extend by 30 days but if I do this will it only last until the 28th of April or will it add 30 days on to the end of my original visa? The 30 days will be added on to the end date of your original visa. Not to the date you go to the immigration office. You can go to renew it a week before, that is no problem. You will have to apply for a Tourist Visa outside Thailand. That may or may not be approved. Hello , I made mistake and I miss my bus for go out of country , I book a new one but I will be overstay for 3 days . I’m ok for pay the 1500 bath but I want to know if I will be ban of the country in the future. First time I’m overstay . Thank you for the answer. You shouldn’t have any problems if you have not overstayed before and pay the fine. I went to extend my tourist Visa (30days） for another 30days and they told me I need some extra papers such as landlords ID and Record book but I didnt register at the condo since Im just staying at friends place. Can I just pay fine for not registering and extend my Visa? No. Immigration require proof of where you are staying. The landlord will have to pay the fine for not registering you. You will have to go back to the immigration office where you entered Thailand. They will be able to correct it as it is a simple mistake. It cannot be corrected when you are leaving Thailand. But if you point it out to the immigration officer, you shouldn’t have any problem or have to pay overstay fine. .
We are traveling for 10 weeks now, and i just notits that we vill have a 3 days overstay in Thailand? Can we pay wen Living Thailand.? Yes. You & your wife can pay the overstay fine when you leave. Your child doesn’t have to pay. You will be able to return when your ban for overstaying illegally is completed. I extended my 60 day tourist visa today. It is valid until April 4th (my 90th day). My flight got changed to the 7th. What should I do? You will have to pay the overstay fine at the airport when you leave. You cannot extend the visa any longer. If I pay my overstay fine at the border when exiting Thailand will I be able to re enter the same day? That depends on the immigration officers on duty. You will have to prove you are a legitimate tourist. You may be asked to show money to support yourself, hotel booking & flight out of Thailand. There’s no penalty for children overstaying. Don’t worry about it. Hello, we are going to thailand for a one month training course at tha bo crown prince hospital april 1-30. We need to arrive a day before the training to prepare and travel from bangkok to tha bo. Is it ok if we arrive in thailand on march 30 and depart april 30. How can we extend our stay for 3-5 days. You can extend at the immigration office nearest to where you are staying. The extension will be for up to 30 days. I have already overstayed for 14 days in Thailand hence i paid my fine at the airport.what if i overstay for 2 days during my next visit?? You will have to pay a fine. 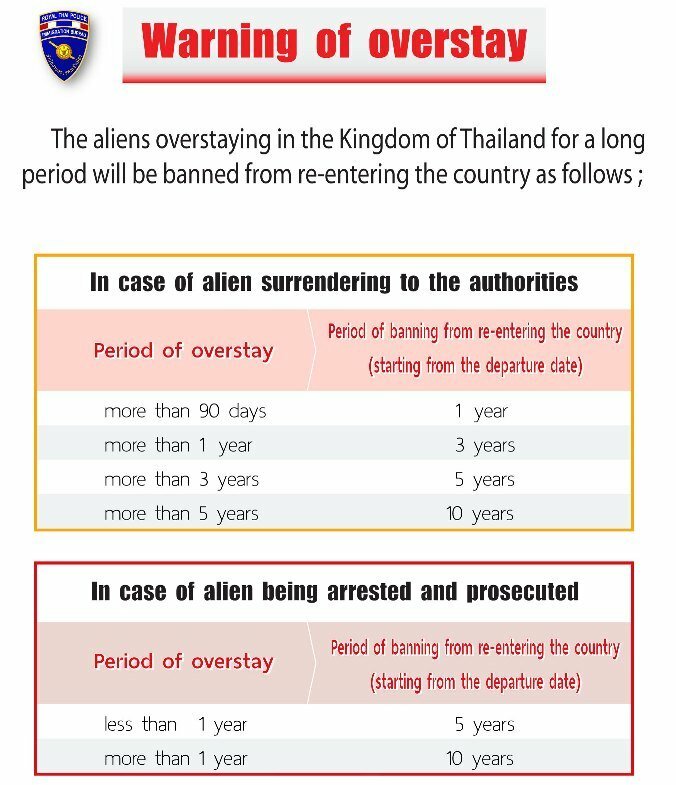 If you keep overstaying eventually you will be denied entry to Thailand. I had no intention to overstay, but when I departed last time, they asked me to pay fine which I paid 1500 bath for 3 days. Any problem to visit Thailand again for holiday 1-2 weeks. It shouldnt be a problem. But you will need to be prepared to show you have the prerequisite cash to support yourself / hotel booking & flight out of the country. Your name, date of birth and face won’t have changed. So you will still show up on the computer system despite changing your passport. You will have to pay the overstay fine at the airport. Why immigration cost 3500bhat for 1 week visa extension? Can you advise me of the local office in Phuket to extend my 30 day visa? Will it be processed immediately? I need 7 more days. Thank you. Is it possible to extension the visa for a week after overstay? No. You can only extend it before you overstay. Not after. Can I still extend it if I go on monday? And if will I have to pay a fine? You can extend it on Monday, that won’t be a problem. But it is better to go on Friday, before it expires. My visa exemption ending date it on a saturday (tomorrow) and as such I can’t get the extension until Monday. Will I be able to still buy the 1900 baht visa extension and be given grace on the fine or will they force me to leave the country? Yes, you cna go the first day the office is open if your visa expires on the weekend or a Thai public holiday. I overstayed in Su-Ngai Golok for 14 days. I was in and out before within my stay limit and realised I overstayed when I lost my passport. What do I do? It is 15 days now.. Should I report for a lost passport and departure card? Will the fine be waived due to my lost passport and departure card? You cna only leave the country if you have a valid passport. So you need to get a new passport and then leave and pay the overstay fine. Hello, my visa is expiring next week on 28th February. The school is already processing my documents and I dont know how long its gonna take to process the documents at the institute and MOE. I don’t want to have an overstay. When should I visit the immigration to extend at least one week as I wait for my documents to be done? How long does the documents for renewal of non b take? How much should I pay for the extension? Ask your school. If they are processing the documents for you then they will know it will take. They will also be able to contact Immigration to explain the situation. They said they dont know if they be able to finish processing in time. When I talk to my agent he says he doesn’t know what to do coz I reminded them late. I feel so confused right now. Unfortunately that’s a problem for you and your agent and school to sort out. The best advice is not to work for an agency. Get hired by a school direct. See ajarn.com for teaching jobs in Thailand. You may have to pay a fine of 500 Baht when you leave the country for a 1 day overstay. I made a mistake by counting days, so I have an overstay of 1 day. Is it alright to pay the fine right at the airport while going through immigration or is it better to visit a immigration office in Bangkok the day before? If you want to be legal you should apply for a visa extension at your nearest immigration office. If not, expect to pay 1,500 Baht fine at the airport. I am a researcher at CRS, Mahidol university Salaya Campus. My visa is expiring on 21 March,2019. My return ticket date is on 17 March,2019. But I get informed through news that all flights are cancelled to Pakistan due to India, Pakistan situation. So what I do in this situation. Contact your airline. You can extend your visa at your local immigration office if need be. Hi. I am presently working here in Thailand. I am going back to the Philippines for good this coming May 4. Often up to 24 hours overstay is forgiven. But that is at the discretion of the Immigration officer on duty. The worst case is a 500 Baht fine. I have overstay 1 day, I paid a fine of 500B then I leaving from Thailand by bus to Cambodia. Can I re-entry to Thailand at the same day or the next day? Entry is at the discretion of the immigration officer on duty. If you meet the requirements, you’ll be allowed to enter.